Snake flower is an evergreen perennial and is a member of the Asphodelaceae that also includes aloe, torch lily (Kniphofia), and foxtail lily (Eremus). It is native to southern Africa where it grows in dry, sandy or rocky areas. Plants have rhizomes that produce sprays of fleshy, gray-green leaves 8 to 12″ long and form quickly form clumps. The starry yellow 1″ flowers appear in slender racemes from spring to summer and have 6 tepals and stamens with hairy filaments. In hot climates plants may go into summer dormancy and return in the fall. Snake flower is drought tolerant and an excellent choice for xeriscaping; it works well as a groundcover, and in borders and containers. 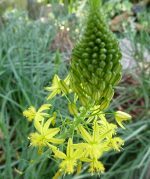 The generic name, Bulbine, comes from the Greek word bolbos, meaning bulb and mistakenly refers to the reproductive structure of the plant which is actually a corm. The specific epithet, frutescens, comes from the Latin word frutex, meaning shrubby and refers to the appearance of the plant. Light:Full sun but tolerates some shade.